Race discrimination at the workplace or at a place of public accommodation can never be tolerated by any person, business or governmental agency. The New Jersey Law Against Discrimination makes clear that an employee has the right to work in a workplace free of harassment, discrimination and retaliation on the basis of race as well other protected characteristics. New Jersey law also prohibits persons from being discriminated on the basis of his or race in places of public accommodation. Unfortunately, some employers continue to allow, or even worse actually participate, in creating hostile environments that are discriminatory toward persons because of the color of their skin. Our New Jersey employment lawyers fight for the rights of employees against all forms of race discrimination whether they occur at work or outside the workplace in places of public accommodation. The New Jersey Law Against Discrimination is considered one of the strongest state laws in the country in stopping discrimination in all its ugly forms. The New Jersey Law Against Discrimination makes it unlawful for an employer to deny the rights and privileges of any term or condition of an employee on the basis of race. The state law also makes it illegal for an employer to retaliate against an employee because he or she makes a good faith complaint of race discrimination and also in circumstances in which an employee is required to participate in a harassment investigation. The law also requires employers provide safe work environments that prevent employees from harassment on the basis of race and for employers to have systems in place that address and remediate any form of race discrimination. Race discrimination is also prohibited under the place in places of public accommodation. Finally, the New Jersey Equal Pay Act makes it unlawful to pay employees less than others who perform the same or similar work on account of his or her race. 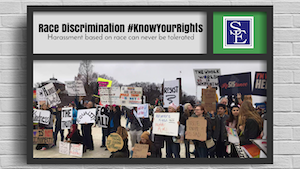 A claim of unlawful retaliation occurs when an employee is subjected to adverse employment action because he or she engaged in protected activity in connection with a race discrimination complaint. An employee can engage in protected activity if he or she makes a reasonable and good faith complaint or participates in any race discrimination complaint investigation. In either case, an employee is protected from an employer taking adverse employment action against the employee because they engaged in the protected activity. Adverse employment action includes termination of employment, but can also include employment actions short of termination such as discipline, demotion, suspension or job re-assignment to a less desirable position. Employers cannot retaliate against an employee in order to cover up instances of race discrimination. Employers are obligated to have in place effective anti-discrimination policies that prevent and remediate workplace race discrimination and harassment. An effective anti-harassment policy should, at minimum, include a clear explanation, with examples, of what constitutes the prohibited conduct, an unequivocal statement of assurance that race discrimination is never tolerated, a full description of the complaint process and clear directions to employees concerning how and who they can complain to concerning race discrimination. Employers must also have a complaint process that includes a commitment by the employer to conduct fair, prompt and complete investigations of any legitimate complaint of race discrimination. Harassment training must be mandatory for all supervisors and, at minimum, available to all other employees. An employer who does not have in place an effective anti-harassment policy will be found liable when incidents of race discrimination or harassment occur at its workplace. A hostile work environment based upon race occurs when the workplace harassment is based upon an employee’s race and the harassment complained of is severe or pervasive enough to make a reasonable person of the same race believe that the conditions of the employment have been altered and the working environment is hostile and abusive. Whether the complained of harassment is severe or pervasive entails a fact sensitive inquiry for a judge or jury to decide. Under New Jersey law, even one incident or comment of race discrimination can constitute a hostile work environment if it is severe enough under the totality of circumstances. Examples of race harassment can include the of directing racial jokes, racial slurs at an employee or in his or her presence, racial stereotyping and other conduct that occurs because of someone’s race. In 2018, the New Jersey Law Against Discrimination was amended to include the New Jersey Equal Pay Act. The New Jersey Equal Pay Act is considered by many as their furthest reaching wage discrimination law in the entire country. Unlike some of the state laws that prohibit wage disparity, the New Jersey Equal Pay is not limited to gender pay discrimination. It also prohibits wage discrimination on the basis of other protected classes including race. This means an employer violates the act if they pay an employee or group of employees less than other employees because of their race. Under the New Jersey Equal Pay Act, an employer is liable for an amount three times the wage disparity of an employee who is paid less than another employee who performs the same or similar work because of his or her race. The New Jersey Equal Pay also provides for broad anti-retaliation provisions for employees who complain about equal pay violations or discuss or disclose other issues relating to potential unequal pay issues at the workplace. The penalties for violating the New Jersey Equal Pay Act are significant, including treble and punitive damages. Persons outside the workplace also have protections against race discrimination in places of public accommodation. A place of public accommodation can include businesses, schools, buildings or other places that are open and offer services to the general public. They can include both public or privately owned and operated places, services, programs or activities. A person, school, business or governmental agency cannot deny the rights or privileges to any individual in the place of public accommodation on the basis of race. New Jersey maintains a strong public policy to eradicate all forms of discrimination at the workplace and places of public accommodation. Harassment based upon race or retaliation for speaking out against race discrimination can never be tolerated. If you or a family member believe they are a victim of race discrimination, retaliation or harassment, please feel free to call our office to speak to one of our New Jersey employment lawyers about the facts and circumstances of your potential claim.